The small cold hardy Windmill Palm is sometimes referred as the Chinese Windmill Palm and is also known as the Chusan palm. The Windmill Palm can be found at the foothills of the Himalyan Mountains. Chinese Windmill Palms are a common landscape sight throughout most of Europe, the United States, and Canada. As such, the Windmill Palm is a cold hardy palm, which has adapted and acclimated to extreme cold temperatures through-out the year and is one of the cold hardiest of palms. Windmill Palm is very tolerant of the sun and tolerant of partial shade. Enjoys well-drained soils and can grow is virtually any environment given the right care and maintenance. The Windmill Palm along with other plants should be watered regularly. 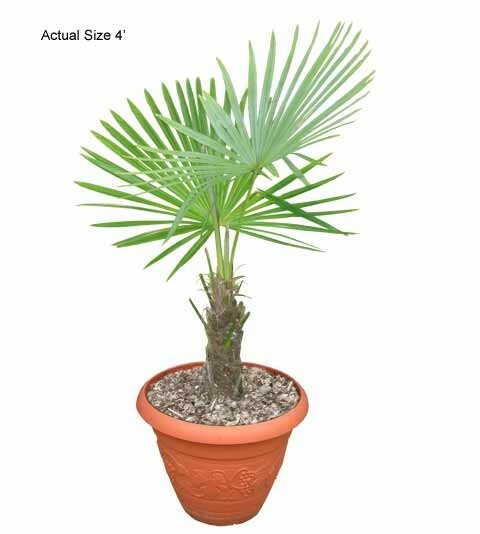 The Windmill Palm looks great as a stand-alone palm tree or encompassed by smaller palms. The Windmill Palm is an exceptional palm tree for colder climates. Gardeners will agree, the Windmill Palm is great for the Northern United States and for its durable nature to overcome most disease and insects. The Windmill Palm is also a great indoor palm tree and even greater for a Conservatory. The Windmill Palm has similar characteristics as the Mediterranean Fan palm. They both are acclimated for cold weather and both have a fibrous trunk which keeps the cold at bay. 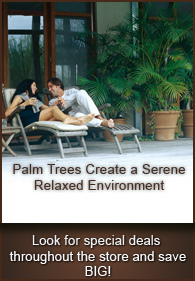 The Windmill Palm is also great for the pool area, patio, or even a Zen garden oasis.